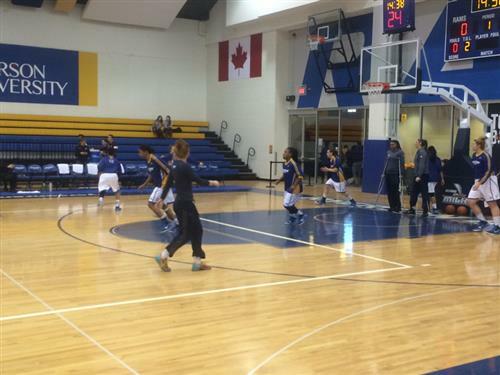 We are live from the Mattamy Athletic Centre, where the Ryerson Rams men's and women's basketball teams are getting set for their opening round playoff matchups. 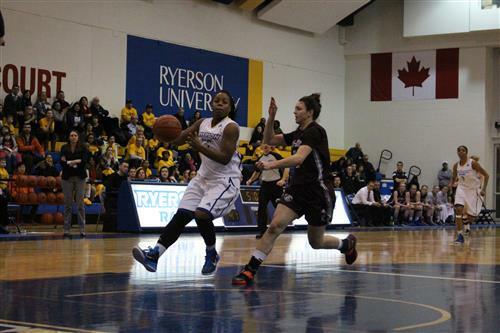 The Ryerson Rams women's team (16-3) is taking on the Ottawa Gee-Gees (14-5) at 6 PM ET. 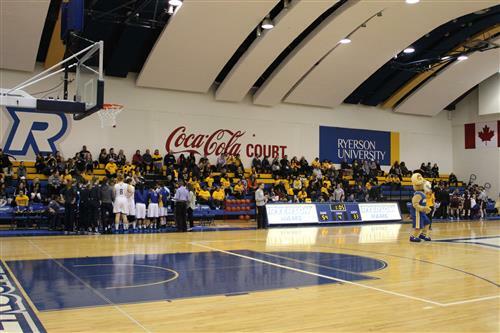 The Ryerson Rams men's team (17-2) will take on the Laurier Golden Hawks (7-13) at 8 PM ET. Warmups are underway as the Rams are getting set to play their opening round match against the Gee-Gees. 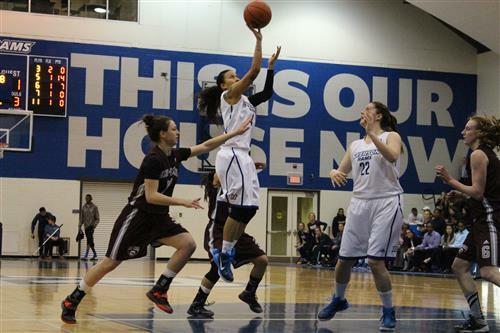 The Rams women's team ranks second in the OUA in points per game. They're up against a team that allows the least points per game in the OUA, something to look out for in this game. And we're underway at the MAC. Ottawa opens with a three-pointer. Gee-Gees lead 3-0. Jez scores the first basket for the Rams. Ryerson draws to within one. We have some rowdy Ottawa fans in the house tonight. Pingue-Giles steals the ball and puts it home off the rush. Ryerson trails 5-4. Ottawa's Julia Soriano commits the first foul of the game. Tiemens to the line shooting two. At the half, Pingue-Giles and Jez lead the Rams with seven points each. Pingue-Giles and Sokoloff lead the team with six rebounds each (one offensive rebound and five defensive rebounds). Ottawa is struggling to get anything going offensively, with only two players chipping in (MacDonald with 14 points and Van Slingerland with seven). The Gee-Gees are just eight for 43 shooting from the field (18.6 per cent). Ryerson has taken less attempts, but made more shots, going 11 for 29 from the field (37.9 per cent). The teams are back on the court for the second half. The Gee-Gees strong suit all season has been their three-point field-goal percentage, something they have struggled with tonight, going 2-for-20 (10 per cent). Cara Tiemens opens the second half with a three-pointer. Ryerson now leads 35-21. Pingue-Giles strips the ball from Ottawa, breaks in alone, but misses the open layup. The Rams are pressuring the ball well; really limiting Ottawa's chances to get anything going offensively. I spoke too soon. Gee-Gees' Jen Stoqua gets her first points on the board, hitting the three to draw Ottawa within 11 points. Pingue-Giles hits the three under pressure to give Ryerson a 41-27 lead. There are five and a half minutes left in the third quarter. 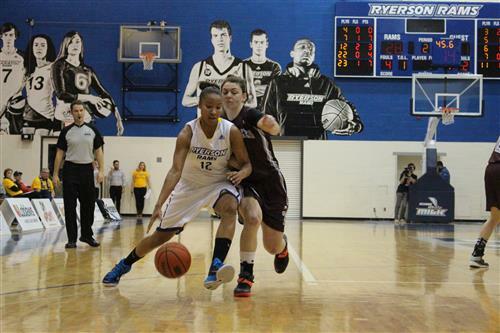 Rams' Pingue-Giles steals the ball from Gee-Gees' Forand, breaks in alone, hits the basket and draws the foul. She'll shoot one. She misses, but Ryerson now has a commanding 43-28 lead. Rams' Sofia Paska hits the basket to give Ryerson a 47-30 lead. Some miscommunication with the Gee-Gees as Ottawa's Jennifer Crowe passes to an invisible person and the ball goes out of bounds. Ryerson gets the ball. Sokoloff is left wide open for the jumper. Ryerson now has a 20-point lead with just over a minute to go in the third quarter. The Ottawa crowd has slowly become quieter as the Rams continue to increase their lead. Gee-Gees' Julia Soriano finally stops the bleeding for Ottawa, hitting the three and pulling her team to within 19 points. The buzzer sounds. Heading into the fourth quarter, Ryerson leads 54-33. Out of town scoreboard update: Windsor 49, Toronto 33. Windsor is the No. 1 ranked team in the country. 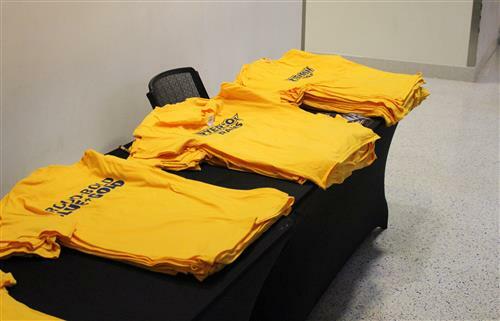 Ryerson lost to them earlier this year by just three points. Nunes hits the three "all the way from Mississauga," says the announcer. Rams lead 57-33. Pingue-Giles hits the basket and draws the foul. She makes the free throw and now has a team-leading 15 points on the night. The crowd size at the MAC is respectable. The fans are making plenty of noise. Pingue-Giles grabs the rebound and powers it home to give the Rams a 25-point lead. Ottawa's Akpene Kwamie fouls Pingue-Giles and she will go to the line, shooting two. Pingue-Giles hits one of two. Ryerson leads 65-40. Jez uses an interesting technique (underhand throw) to make the basket, but it just misses. Ryerson has really had a killer instinct in this game. The girls won't let up. Pingue-Giles now has a team-leading 20 points.